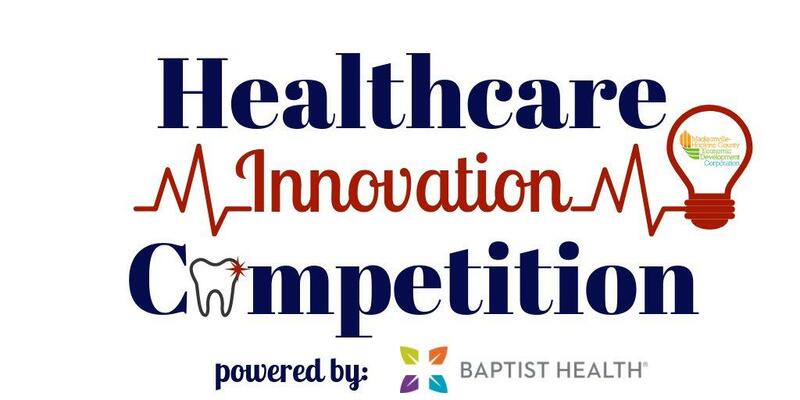 OFFICIAL COMPETITION RULES OVERVIEW: Madisonville-Hopkins County Economic Development Corporation and Baptist Health Madisonville are collaborating on the 1st Annual Healthcare Innovation Competition. The Healthcare Innovation Competition is open to and encourages participation from all individuals age 18 or above. $5,000 in prizes, mentoring, access to business advisors, including collaboration prizes from world-class healthcare systems, will be awarded. By applying to participate in the HEALTHCARE INNOVATION COMPETITION, the applicant agrees and understands that participation in the HEALTHCARE INNOVATION COMPETITION is subject to the terms and conditions contained in these rules, all of which are binding. 1. The Healthcare Innovation Competition welcomes innovators, collegiate and professional, working with big data, artificial intelligence, enhanced reality and other disruptive technologies to engage patients and clinicians and take healthcare to new levels. 2. The HEALTHCARE INNOVATION COMPETITION is open to teams of 4 individuals or less who are at least 18 years of age. 4. Only English-language submissions will be considered. 1. To submit an entry into the HEALTHCARE INNOVATION COMPETITION, visit the application website www.westcentralky.com beginning January 25th 2019. 2. The final day to submit an entry is April 15th, 11:59 PM CST. 3. There is no cost to enter the HEALTHCARE INNOVATION COMPETITION. 4. Submissions for acceptance into the HEALTHCARE INNOVATION COMPETITION are reviewed and accepted by the selection committee on a rolling basis, beginning April 1st, 2019. See below for selection criteria. 5. Approximately 20 teams will be accepted into the HEALTHCARE INNOVATION COMPETITION. 6. The Organizer and Organizing partners reserve the exclusive right to set and adjust the number of teams accepted into the Competition. 7. Accepted teams will be notified no later than May 1st, 2019. 8. Once a team has been notified of its acceptance into the competition, that team has 48 hours to reply with its desire to participate in the HEALTHCARE INNOVATION COMPETITION. If no reply is received within the 48-hour window, the invitation will automatically be withdrawn and Organizers will accept another team until the allotted teams are confirmed. 10. The HEALTHCARE INNOVATION COMPETITION will offer assistance in putting together the business plan model as well as pitch practice. Training date will be announced at a later date. ​11. Final Date for Application is May 31st, 2019. 12. The HEALTHCARE INNOVATION COMPETITION will be held in July at Trover Tower 8th Floor. a. Whether the application is complete and adheres to the requirements of the application website. b. Whether the solution proposed is viable. Viability will be assessed from a technical and market perspective. c. Whether the assembled team has the requisite skills and experience to contribute to the success of the project. d. The degree to which the solution has an impact on improved healthcare. Competition winners will be chosen by a panel of judges solely selected by Organizer and Organizing Partners. Judging will begin the morning of July 27th, 2019. Judges will be provided with an overview of each business canvas model based on application materials submitted. Each judge will score each team during their product demonstration and pitch presentation based on the approved judging criteria using numerical ranking. At the completion of all pitch sessions, the judging panel will convene, review results and determine the final rank order of the presenting teams. The panel will assign the appropriate winners in rank order of their placement. Applications will be evaluated on the criteria of commercial viability, technical viability, financial viability, use of proceeds, strength of the team, presentation of the business canvas model, and the impact factor. 1. Receive In-Kind services from collaborating partners such as attorney and accounting services. i. Organizer is not responsible for any dispute among team participants related to prizes. ii. Each Participant is solely responsible for any applicable taxes for prizes awarded. iii. Prizes are not transferable. i. Madisonville-Hopkins County Economic Development Corporation will provide an award letter with amount, signed by a competition official, to each team. ii. With each letter will be a form W-9 and a stamped, addressed mailing envelope. event Organizer in the envelope provided. iv. Payment will be sent by mail within 30 days of receipt of signed letter and W-9. address specified on the W-9. 1. Organizer has the right, at its sole discretion, to disqualify any participant or team for a violation of the rules. 2. Organizer may prohibit certain contestants or teams from participating in the HEALTHCARE INNOVATION COMPETITION or winning a prize if, in its sole discretion, it determines that a contestant or team has attempted to undermine the legitimate operation of the HEALTHCARE INNOVATION COMPETITION by cheating, hacking, deception, or any other unfair practice. 3. Organizer has the right, at its sole discretion, to disqualify any participant or team that attempts to abuse, threaten or harass any other participants or representatives of Organizer. 4. Entries containing pornographic material, defamatory statements or deemed offensive by Organizer are prohibited from participating in the competition. 5. Ineligible entries may be disqualified at any time without notice. 6. Teams must have at least one team member participate during the “Pitch Practice” session. 7. Teams must have at least one team member present at the awards ceremony to claim their prizes. 1. Organizer has the right to cancel or suspend the HEALTHCARE INNOVATION COMPETITION if there are not enough applicants. 2. Organizer, and Organizing Partners, are not responsible and Participants hereby waive any claim for damages, claims, losses, or inconveniences caused by cancellation or suspension of the HEALTHCARE INNOVATION COMPETITION. 1. By providing a submission to the HEALTHCARE INNOVATION COMPETITION, each Participant represents and warrants that the submission does not violate any applicable law or any third party intellectual property rights. 2. Organizers and Organizing Partners do not make any claims to or take responsibility for IP that emerges from the HEALTHCARE INNOVATION COMPETITION. 3. It is up to each team, solely, to determine ownership of any work that is created and developed during the HEALTHCARE INNOVATION COMPETITION. 4. Organizers and Organizing Partners accept no responsibility for resolving IP disputes among Participants. 5. The risks of exposing an idea and/or IP may be outweighed by the benefits of the feedback and collaboration you will receive if people get excited about your submission. 6. If you have concerns about the IP in your submission, we recommend consulting a lawyer before participating or sharing said IP. 1. Participant understands that the HEALTHCARE INNOVATION COMPETITION may be photographed, videotaped, recorded, etc. and that the news media may be present on one or both days of the event. 2. Participant hereby grants Organizers the right to use or refrain from using Participant’s name and/or likeness in any video, photo, recording or media b-roll without Participant’s review, approval or compensation. 3. By applying to and/or participating in the HEALTHCARE INNOVATION COMPETITION, team members expressly consent to the collection of personal information. Personal information is collected for the purposes of registering teams for the HEALTHCARE INNOVATION COMPETITION, administering and promoting the HEALTHCARE INNOVATION COMPETITION, and communicating about current and future events. 4. Applicants and participants expressly consent to receiving electronic messages relating to participation in the HEALTHCARE INNOVATION COMPETITION. Their application and participation in HEALTHCARE INNOVATION COMPETITION, if accepted, will fully comply with these official rules. 1. Under no circumstance will Organizer, Organizing Partners or Sponsors be liable for any direct, incidental, indirect, special or consequential damages incurred by any participants or third parties in connection with, arising out of, or relating in any way to the HEALTHCARE INNOVATION COMPETITION or the official rules. 2. Participant shall indemnify and hold Organizer, Organizing Partners, Sponsors and their officers, directors, employees, successors and assigns harmless against any claims, losses, damages, liabilities and expenses (including reasonable attorneys’ and other professionals’ fees) incurred by Participant in connection with, arising out of, or relating in any way to the HEALTHCARE INNOVATION COMPETITION or the official rules. 3. All disputes, claims and causes of action arising out of or in connection with the HEALTHCARE INNOVATION COMPETITION, prizes, or the official rules, shall be resolved individually, without resort to any form of class action, and exclusively by the state courts in the State of Kentucky for the County of Hopkins; Participant submits to the exclusive jurisdiction and venue of such court for the purpose of any action. 4. Participant agrees not to use in any advertising, publicity, marketing, press release, or in any other way, the name, trademark, logo, symbol, image, likeness or other intellectual property of Organizer, Sponsors, or Organizing Partners without the prior written consent of Organizer, Sponsors, or Organizing Partners respectively.